Three Ways to Switch to a New iPhone? How to Switch to New iPhone? Changing from one iPhone to another can be more tedious than it sounds depending on the method you choose. Luckily there are multiple methods and they range from complex to very simple. The best news is that there are newer methods with the advanced technologies which allow you to do the easiest and most simply of backup/restore process if you prefer it. Let's start with some of the old-fashioned ways to switch from one iPhone to another. You can switch to a new iPhone X/8 using the QuickStart method. If your old iPhone and new one both run iOS 11, this may be the best method for you. Follow the steps below. 1, Turn on both devices (preferably running iOS 11) and bring them near each other. 2, The Quick Start screen will appear so you can set up using your Apple ID. Keep the devices near each other and center the animation in the viewfinder. 3, Use the camera method if your old device can do so, or tap the choice to authenticate manually if you cannot use the camera. 4, Leave the devices near each other until all data and settings have been transferred completely. You can follow up by transferring data from other devices such as an Apple Watch, etc. You can also switch data and service to new iPhone by backing up old device and then restoring the backup to new iPhone. This method works even you have an older iPhone or one not running iOS 11. More than one software or service can help you to switch from one iPhone to another and we will discuss in the following parts. 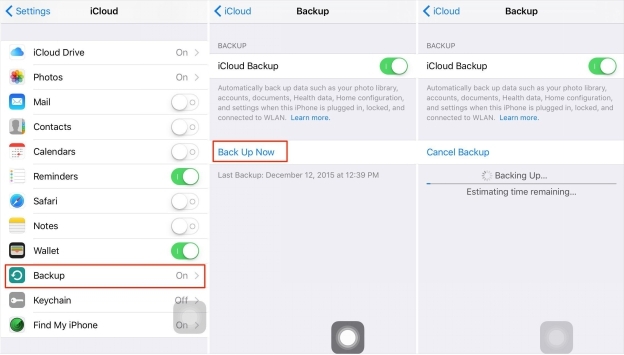 Just connect your old iPhone to Wi-Fi network and then go to Settings > [your name] > iCloud > iCloud Backup. 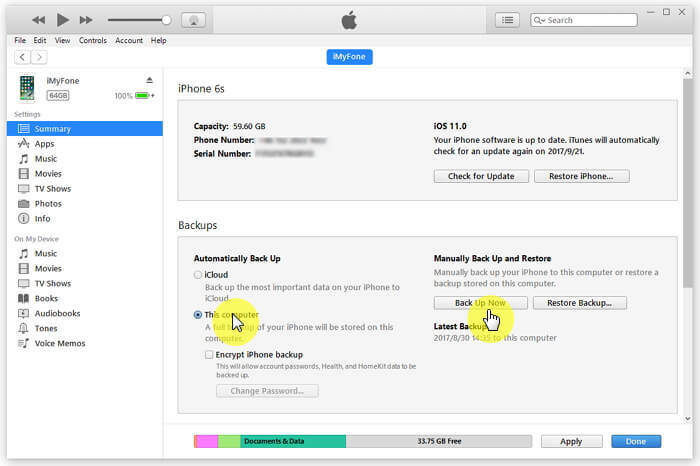 Make sure that the option iCloud Backup is toggled on and then tap Back Up Now to finish the iCloud backup. Start your new iPhone and set up it until you see the "Hello" screen. Connect to Wi-Fi and then follow the on-screen instructions until you see the Apps & Data screen. 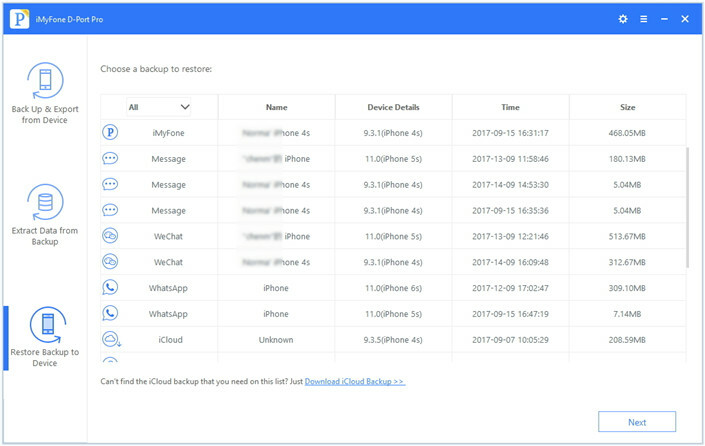 Choose Restore from iCloud Backup and log in your iCloud account to choose a backup and restore it. Run iTunes on your computer and connect the old iPhone to it. Go to the section of Backups. Click Back Up Now and wait iTunes to finish the process. 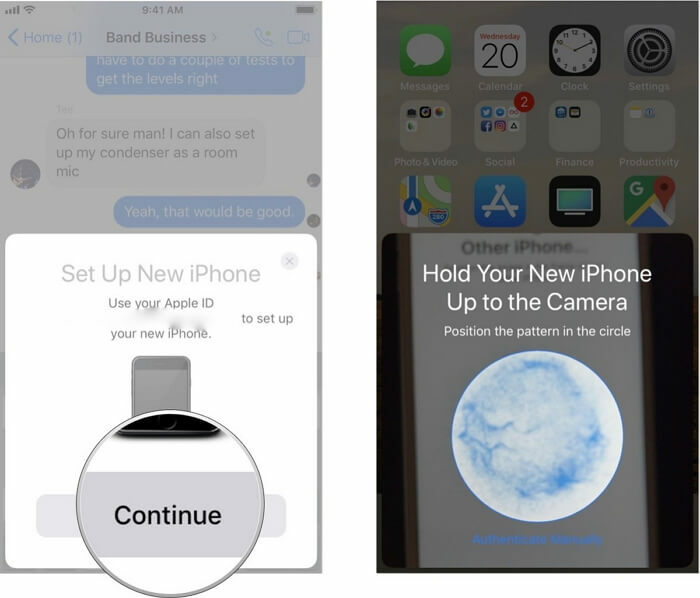 Now connect the new iPhone to iTunes and turn it on, wait for the Hello screen and then choose Restore from iTunes backup on the Apps and Data screen. Click Restore Backup… on iTunes and wait for the restore process to finish. 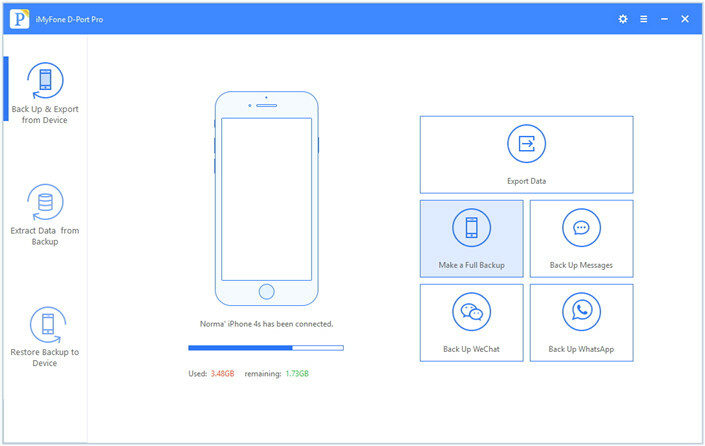 iMyFone D-Port Pro is a flexible method that can be used to backup and restore iPhone, iPad, and iPod touch. It allows for selective restoration of an iTunes, iCloud or iMyFone backup so you have more options than with most methods. What can the program do when we are talking about how to switch to new iPhone? It can switch to new iPhone from different iTunes or iCloud backups. Users can select the data they need to restore and ignore the ones unnecessary. It can also freely back up iOS device according to users' need. For example, you can back up only WhatsApp data on iPhone. You can view data in backups on computer without restoring. You can view your iCloud photos easily with it. It is compatible with all iOS devices, including the latest iPhone X and iPhone 8. The following steps show how to switch from one iPhone to another with iMyFone D-Port Pro. You will know that it can do more than you expect. Run iMyFone D-Port Pro and connect the old iPhone to it. Choose Back Up and Export from Device and you can see what the program can do for you. You can even choose to only back up Messages, WhatsApp or We Chat. Since you want to switch service to new iPhone, choose Make a Full Backup and finish the process according to the program's prompts. Note: The backups the program makes won't overwrite any previous backup on your computer. Disconnect the old iPhone and connect the new iPhone to the program. Click Restore Backup to Device and choose the backup the program has made. Click Next you will see that you can restore all the data and settings in the backup, or only restore partial backup. Choose Restore Full Backup and follow the on-screen directions. Do not disconnect your device during the process. 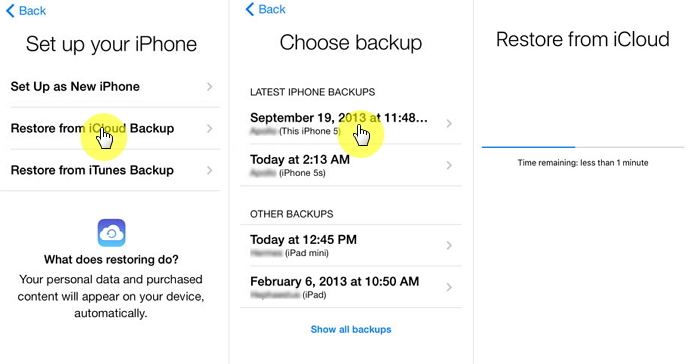 If you don't need a full backup, you can selectively switch data from one iPhone to another. This again works for all devices running varied iOS versions, including iOS 11. 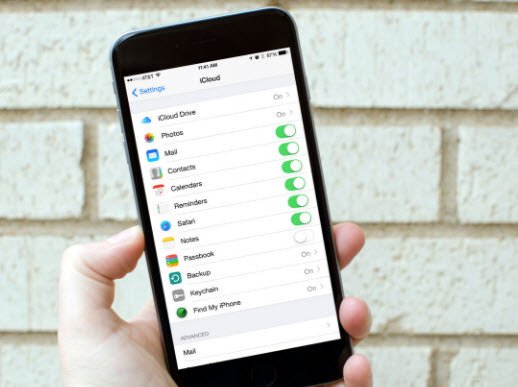 On your old iPhone, go to Settings app and log in your Apple ID and connect your iPhone to Wi-Fi network. Toggle on all the apps you want to switch to your new iPhone in the iCloud page. Then the apps should start syncing with iCloud, although there's no progress bar to see how much has been synced.